Long before the X-wing fighters faced the TIE fighters in the original Star Wars trilogy, Naboo starfighters were engaged in a fierce battle against the Trade Federation. 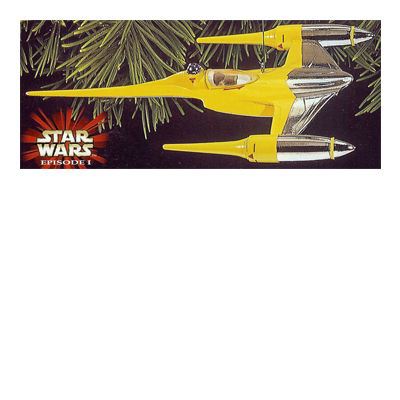 This ornament represents one lone Naboo Starfighter, caught in the maelstrom of combat. Aboard were young Anakin Skywalker and R2-D2, a brave and resourceful astromech droid. All around them, Naboo pilots of Bravo Squadron were attempting a nearly impossible mission: get through the field of Trade Federation droid starfighters and immobilize the massive droid control ship.